400 STUDENTS AND STAFF ENJOY FREE HOT, NUTRITIOUS LUNCHES AT BARNER LEARNING CENTER EVERY FRIDAY. Madam Elvie and I went to the kitchen very early to see what needed to be done first for the feeding program. Of top priority is cleanliness, so we started scrubbing. Then people kept coming and volunteering to help out! Parents, staff…it was wonderful! What a team we are! Everybody was cleaning and cooking while some were preparing. The feeding started on time. Everybody was happy and ate all their food. It was really fun seeing the kids being fed. The atmosphere was so happy and cheerful! I helped cook, and many others also helped out. Some of the pastors were cooking big pots of rice outside over campfires because there was not enough room in the BLC kitchen to cook enough rice for 400! 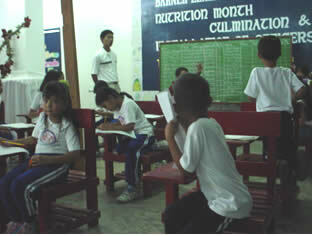 The students are quiet for once, because their stomachs are full. …you call motor oil “hauler”. Friends have spread by word-of-mouth the need for these destitute kids to have an education, and as a result sponsors from 8 different countries are sending their $20 per child to cover uniforms, tuition, books, etc. Each month a church in Vermont has pledged to give $100 for this food program. A few dozen times a year, God touches the hearts of friends from many different locations to give to the Emergency Medical Fund. We use only the interest on these funds, so there will always be something available for the kids in need. After people gave money so we could buy the busses, a church in Pennsylvania gives monthly for part of our gas expenses, and a friend from New York helps with part of the salary of one of our drivers. Construction is expensive. Rarely do we receive enough funds to build a building. However, occasionally someone receives an inheritance and gives some to BLC for construction. One woman lost her paycheck, and when she found it, gave it to BLC! 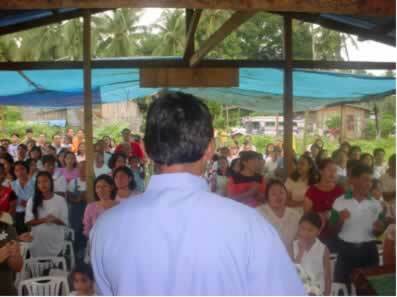 FAITH FELLOWSHIP CELEBRATES THE 1ST WORSHIP SERVICE AT ITS 3RD CHURCH PLANT, IN A MAKESHIFT SHELTER AT PANUNTUNGAN. “Praise God for His provision! Praise God for His Provision! Everybody at BLC is so pleased with the feeding program each Friday! 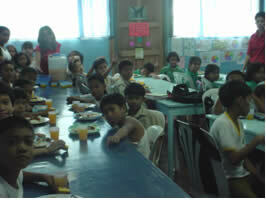 Kids are thrilled with the nutritious food given: apritadang chicken, steamed rice, a banana piece, a glass of juice. Feeding 400 people is indeed a challenge! But when many commit to help, the job becomes lighter and quicker. We cooked rice and viand outside the school at the San Antonio Street side, and the drivers even helped making a temporary “dirty kitchen”. Everybody got involved, in one way or another…preparation of the ingredients, chopping the chickens, cleaning up the meat, chopping the spices, squeezing all the lemons, mixing the orange juice, cooking the rice, serving to all the kids in their respective classrooms, cleaning up all the dishes, and even marketing. 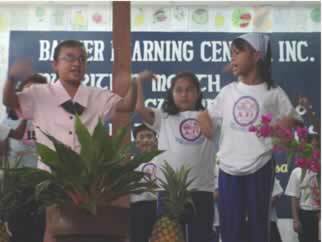 BLC KIDS PERFORM DURING OUR ANNUAL NUTRITION FESTIVAL.